It is that time- Teacher Appreciation Week is May 6-10 this year and I have some awesome ideas and ways for you to say thank you to your childs teachers. 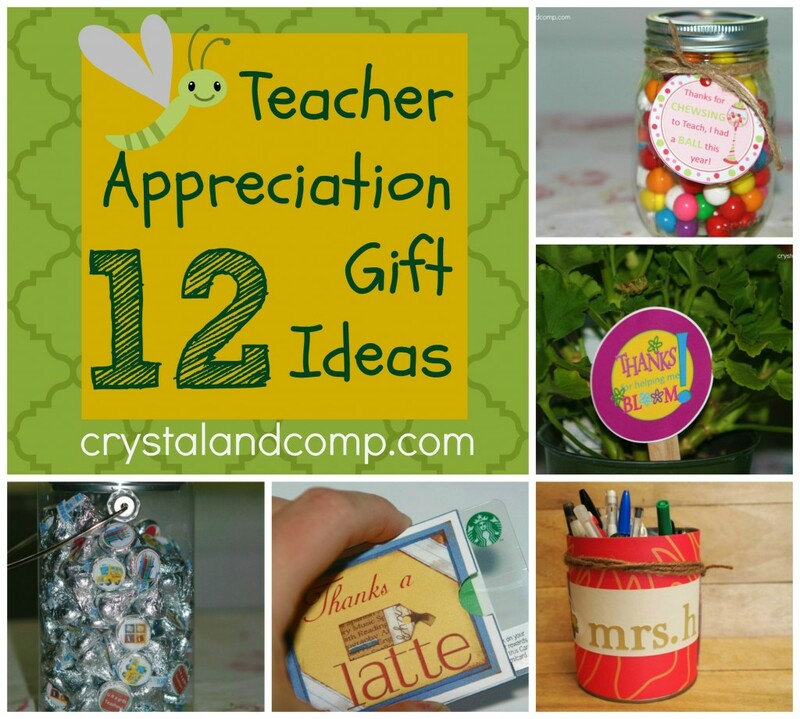 All of these teacher appreciation gift ideas are easy to make. You do not have to be super crafty person. Many of them come with free printables. Often times you give one gift a day to your teacher for the week. Sometimes your school will have a theme each day and some schools just go with the flow and you bring whatever you want. Any teacher would love to receive any of these as a gift. I even share with you step by step how to make each of these gift ideas. Teacher Hershey Kiss Printable– this is the sweetest gift ever. I provide you with the printable that you run off on a sheet of labels. Then use a small circle cutter to cut them out. Peel and stick to Hersheys Kisses. Thanks for Helping me Bloom Flower Pot Picks (free printable)- want to give your teacher flower, but want a fun printable to go with it? These take a flower to from a simple gift to an awesome! Thanks for \”Chewsing\” to Teach Bubble Gum Printable – teachers tell you no bubble gum in class, but bubble gum balls in a Mason Jar make the cutest gift ever. Love this printable on this one too! Homemade Pencil Holder– every teacher needs at least one (or two, or three) pencil holders. Why not make her a personalized one? Love this fun idea that anyone can make! Thanks A Latte Gift Card Holder (free printable)- teachers love coffee! Here is a gift card holder that you just print, fold and glue. Tea-riffic Teacher Water Bottle Printable– love this water bottle printable. Take a Crystal Light tea packet and attach it to the front of the bottle with my precious printable. Flower and Button Clothespin Magnets– magnet clothespins are perfect for teacher who love to hang things in the classroom. You can make these… easy breezy. Teacher Picture Frame– every teacher needs a picture frame of her class at the end of the year. I show you how to use scrapbook embellishments to make this affordable memory keepsake. Teacher Popcorn Gift Printable – easy and affordable this printable can be attached to a bag of popcorn. We Need Smore Teachers Like You Printable– give your teacher this delicious smore treat! Love this printable. DIY Teacher Water Bottle Thank You Gift– decorate water bottles using scrapbook embellishments. Homemade Mod Podge Vase (for flowers)- use a leftover spaghetti jar and fancy it up with Mod Podge. Tada- you have a handmade flower vase. As a teacher in the middle school, teacher appreciation day never makes it to me. I love all of these little gifts and I know teachers love getting little things to say thank you. In the early years, when a student has just one or two teachers, it’s easy but by middle school, with 10 teachers, it’s just too much. Sad because some of these are sooooooo cute! I love the smores idea! What a great collection of idea to show how much teachers are appreciated! I’m still cracking up over Thanks a Latte! 🙂 Thanks for sharing with us on Throwback Thursday!